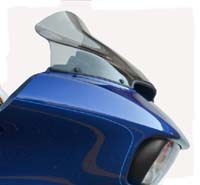 Road Glide & Tour Glide windshields...choose height to improve ride-ability! Allows rider to look OVER -- comfortably! Premium Windshield Cleaner & Polish, 4 oz. Note: To offer all the windshield types, model years, heights and tints, we manufacture/fab most windshields per customer order so please allow 1-3 weeks processing time prior to shipment of your order. All windshields are custom orders and not returnable. WCV-RL: Uncomprimised comfort from the harsh wind and the quietest ride in the industry. We offer custom solutions for your Harley Davidson in a variety of colors, sizes, and side cut options. 4 different heights, 2 different side cuts, and 3 finishes to choose from. Fits all 2015 and newer FLTR, FLTRX, FLTRUSE Models. Two different shapes to choose from. 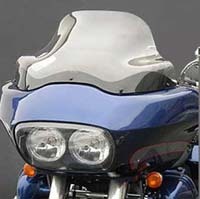 The Wide option is the widest and provide best coveage and is 1" wider than the stock CVO windshield. The Scolloped option is narrower than the Wide version but wider than the stock Road Glide Standard and Special windshields. 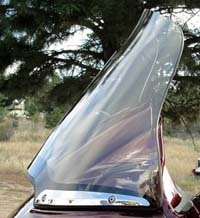 Both options are molded with Recuve top and sides which redirects the airstream outwards as well as over the rider. 4 Different Heights Available to Tailor the Shield Height to Your Height and riding style. 2 Different Shapes Choose the Scalloped cut for a sportier appearance and/or Custom Bars or choose the Wide cut for Max Coverage on Long Rides. Side Recurves Push Air outward Producing a Larger Pocket for operator and passenger. Scalloped shields were designed to work with many different styles of Raised Bars for better clearance. Windshield height is taken from bottom ridge of center dash to the top of the windshield. WR-RM: Road Glide 2015+ Stock Windshield. Original shield measures 8" tall from the top center of the cut out to top center of the shield. All Sport shields measure about 16.5" wide just below the crown. Touring shields measure about 18" wide and feature a wider mid-section (widths may vary fractionally). With HD's proprietary venting system, there's really les need for a reverse curve. It can be more about finding a shield with the right style, fitment, height and tint. We make no mention about having to look over it... Why? Because our shields provide excellent optics, free of distortion, so you don't need to worry about that. With two different styles, four heights & three tints, we build a shield that suits your specific riding needs. If you need a size that's not listed just let us know and we'll make it! First we closed the lower slots with a direct hole design. Then we closely paralleled the shield from edge to edge creating a uniform line that fits snug against molding with no gap at the corners. All shields feature a painted lower black mask with polished edges for a glass like appearance that's second to none. Our WR-RM shields measures about 30% thicker than most others and made in the USA. Thicker glass provides better stability at highway speeds with less vibration at idle. Plus it significantly reduces or eliminates the surface indentation marks present on other shields. Installation kits create a wider foot print for the best stability with minimal or no indentations marks. Just make certain the plastic washers contact the shields surface and never the steel. Place the steel washer onto the screw followed by the plastic and install. Always start by hand, 2-3 full revolutions prior to using any tool. Tighten 3-5 inch pounds, or about as tight as water bottle cap. Tight enough so it would not leak but not so tight that the bottle would twist. You can always be a little bit loose, then re-torque later. For the best appearance, push the outer plastic washers slightly upwards while tightening. Manufactured from .187 cast acrylics (aircraft grade). Available in clear, opaque black, light & dark gray tints. 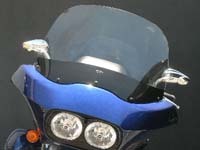 WCV-EM: Slightly curved lip windshield for Road Glide model years 1998 to 2013. 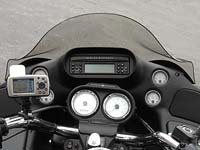 Select the tint and vertical height by measuring straight up vertically from the top of the gauges as shown below. We will email you back with any height adjustment that might need to be made to your requirement and any price modification (taller windshield may be up to ~$49.99 additional fee). 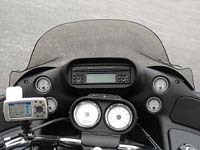 WR-12 to WR-20 Stock Windshields: Windshield's edge can sometimes obstruct the rider's field of view. Looking through the windshield adds distortion and reflections, even when it's perfectly clean. Most riders agree: looking "over" the windshield is preferred. 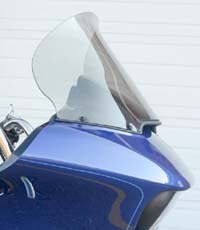 In addition, the standard Road Glide windshield can create buffeting and noise. We offer a selection of windshields in various heights and tints. Economical alternative to OEM replacements. Available in regular, custom or super-step-contour. 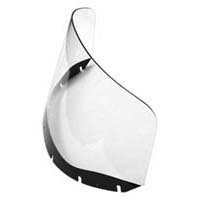 Acrylic Windshields: Manufactured with utmost quality incorporating a beautiful polished edge. 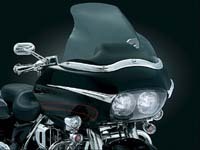 The products are completely thermoformed, annealed, formed to fit and ready for bolt on installation on your Electra Glide. 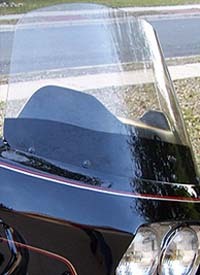 Windshield heights are measured from the top of the windshield to where it meets the Electra Glide fairing. Installation is very easy. Optional Tints: clear, light grey, dark grey or opaque black. 9" versions and above should be ordered as clear or light tinted. We also offer the WCP-1 4 oz. Premium Windshield Cleaner and Polish in a convenient travel/touring size you can take along on the bike. Cleans, seals and restores protective glaze. Protects against stains, oils, salt, grime and dirt. Removes fine scratches, restores clear vision. Durable glass-smooth finish. Unaffected by sunlight & temperature. These are exact fit replacements for the factory windshields. We produce various heights to match your riding style adn comfort. The optical clarity is excellent and we offer many tints to highlight the style of the bike. 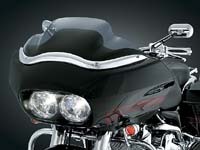 Our windshields have the new adn improved design for the ultimate fit on your Road Glide. For years it has been reported by numerous riders, mechanics and Harley parts professionals alike that the OEM modling/trim is troublesome and has always had a less than perfect fit. These windshields have eliminated the vertical mounting slots on the shield and now we offer direct hole mounting for all FLTR's. When used in conjuction with the hardware mounting kit (sold separately), you will have a rock solid fit you never thought would be possible. No more unsightly gaps or indentation marks on your shield ever again. 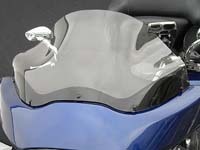 We closely matched the shield to the fairing contour so you don't have to hassle with the trim fitting issues anymore. The new design closely parallels the OEM fairing so the trim piece is no longer needed. The OEM modling/trim can be re-installed however modification is likely. For the very best results discard the OEM molding/trim. Clear and all tinted shields are painted black at the fairing bottom. 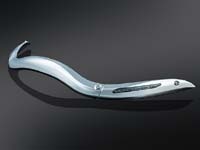 WRL Road Glide Contoured Lip: What is the best size for me? The top of the screen should be approximately mouth level while you are sitting on your bike (comfortably out of your line of vision). 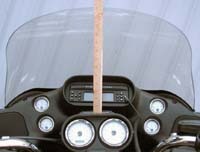 How do I measure for my Road Glide? 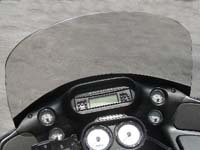 Sizes are measured from the center bolt on the fairing along the windshield. Our aero dynamically designed windscreen performs 3 to 4 inches taller than it is. Bigger isn’t always better with our screens. The WRL line is a unique design that has been proven to be very effective. The flat surface in the middle with a flip at the top creates a smooth airflow up over your head. 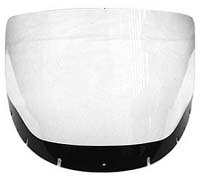 Using the impact modified DOT approved material and the unique shape, the WRL is a sturdy, nice looking, functional windshield that actually works. Please be advised that this shield will not mate with original CVO lower molding or any chrome trim. This shield is specifically designed to eliminate the need for any molding or trim piece. This design closely parallels the faring from left to right for an almost seamless appearance for the best fit ever. The absence of the trim does not affect the performance or safety of the shield. A lower trim piece can be installed but modification or trimming may be necessary. Manufactured from .150 gauge aircraft grade acrylic and available in clear, light & dark gray tints. Suggested Sizing is for most average body builds on the original seats. Riders that are caught in between sizes need to determine torso, posture and neck considerations for best results. It is always better to be on the next shorter size when ordering dark gray, (Must clearly see over the shield). 13" for most riders 5'5" to 5’7"
14" for most riders 5'8" to 5'10"
15" for most riders 5'11" to 6'1"
12" for most riders under 5’8"
13" for most riders 5'9" to 5’11"
14" for most riders 6'0" to 6'2"
15" for most riders 6'3" to 6'5"
Super Step Contour: By combining a step contour on the frontal plate of the windshield we were able to bring the trailing edge air closer to the rider. The result is a shield that pushes the air up and over the rider which reduces or eliminates the turbulent buffeting effects associated with other shields. 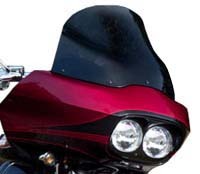 Unlike the competition our shield is tall enough to be effective and will enhance the look of any Road Glide with two different designs to choose from. Measurements are taken from the lower center hole to the top center of the windshield and all shields are designed to be looked over. The height is measured along the contour. Five sizes to choose from and all shields are painted on the lower portion with a black mask. It has been reported by riders and professionals alike that the original lower trim has always had a less than perfect fit. We’ve eliminated the lower mounting slots and created a closed hole mounting design. This provides additional strength with no more unsightly open slots on the shields lower surface. We designed the lower portion of the shield to parallel the faring from left to right so the lower trim piece is no longer necessary. It’s just a matter of personal preference but the absence of the trim does not affect the performance or safety of the shield. A lower trim piece can be installed but modification or trimming may be necessary. When used in conjunction with our upgrade installation kit, you will experience a rock solid fit that you never thought possible. The optional chrome moldings will fit however modifications may be required at the buyer’s expense. This model does not include the WR-MK mounting kit, which is optional. Manufactured from .150 gauge aircraft grade acrylic and available in clear, light & dark gray tints. 14" for most riders under 5’6"
15" for most riders 5'7" to 5’9"
16" for most riders 5’10 to 6’0"
15" for most riders 5'10" to 6’0"
16" for most riders 6’1 to 6’3"
15" for most riders 5'6" to 5’8"
16" for most riders 5’9 to 5’11"
WRK-15: The Pro-Touring Flare model is a wider, more full-coverage option for riders and passengers that prefer an even greater amount of wind deflection for the long haul, and is still stylish enough to use around town. Expect the same improved stability that the Flare is known for! Available in Clear, Tint and Dark Smoke. The 15” Pro-Touring appears much taller because of its more vertical stance. WRK-14: The Sport Flare is more streamlined and offers radical curves and a sportier stance. It compliments the lines of the new fairing with a more aggressive profile, and aids stability and handling with improved air management. Still awesome for the long haul, definitely kool for showing off your ride. Available in Tint and Dark Smoke. The 14” Sport is comparable to our old 12” because it lays back quite a bit, so it’s not really that tall. Flare: All Step Contour Flare shields are Hard-Coated Polycarbonate. These Windshields are measured from the center bolt hole to the start of the lip on the top of the windshield. Wind tunnel designed and tested, the “hips” provide added downforce while the “flip” direct air over the rider to help eliminate the swirl of air found in front of the rider on standard windshields. WRK-16: designed for long-haul touring and/or ‘taller than average’ rider. Ride in a variety of weather conditions, but still get the downforce of the shorter shields. Protection and performance. Some riders will look through this shield. WRK-12: hybrid model. Combines the sporty style & performance of our 8” with the taller touring height of our 16”. The additional 4” of shield above the performance model will allow you to tuck behind it if the weather turns quick, although it is still low enough for you to see over it. 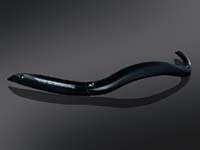 WRK-8: The performance 8" is perfect for the riders that like to ride fast and doesn’t mind some wind in their face. 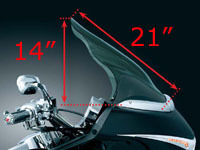 How are 2015" Road Glide Flare's measured: To determine what height will work best for you, choose a height you can comfortably look over when riding down the highway. Always consider your riding posture when selecting the appropriate height. The height are measure down the front center of the shield, along the slant of the shield from bottom to tip. 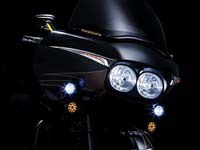 Road Glide Sport Windscreen: Innovative design & exceptional styling - the WR-S creates a cockpit-like feel & streamlined appearance. Unlike other short windshields on the market, the WR-S directs air smoothly over the fairing resulting in constant, predictable wind pressure on your face without annoying buffeting & turbulence common to other short windshields. Made from dark smoke, premium quality, hard-coated polycarbonate, it provides exceptional impact resistance. 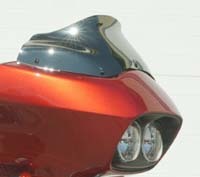 The bottom edge has been masked for an exceptionally clean appearance when installed by itself or when used with the Road Glide Windshield Trim for an even cleaner appearance. Fits '98 to current. Height: 11.5" tall. 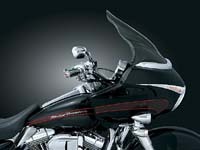 Road Glide Touring Windscreen: Provides excellent wind protection & unmatched style. 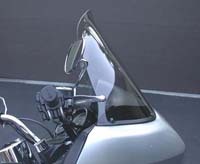 Unlike anything you've seen before, this windshield allows you to get rid of the frumpy stock windshield & replace it with a piece that transform the look of your bike from city bus to private jet. 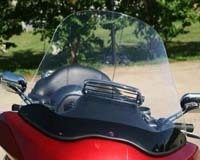 The windshield's contours complement the lines of both the inner & outer fairing while directing the wind up & over the rider with minimal turbulence. Made from light smoke, premium quality, hard-coated polycarbonate, it provides excellent impact resistance. The bottom edge is masked for a neat appearance with or without our Windshield Trims. Fits '98 to current. Height: 21" from center bolt to top, 14" from the base to top. 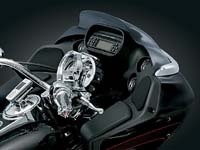 WT-178, 179: Fits all of your stock 2015 to present Road Glide riders. Machined made for that precision cut. Hide the ugly factory bolts with these new accents and customize your Road Glide. 2632, 2633, 2634, 2635: Enhance the transition from windshield to fairing on 2015 & later Road Glides™with these chrome or gloss black Side and Center Windshield Trims that provide a clean, smooth-flowing appearance. Choose the Side Trims only, or complete the look with the Center Trim for full coverage. Made from lightweight injection-molded ABS, installation of the Gloss Black Trim pieces reuses OEM hardware while the Chrome versions come with stainless steel replacement screws. Fits 2015+ Road Glide. 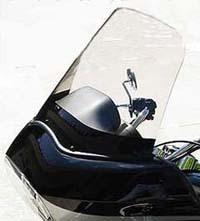 1338, 1339: Cover that unsightly area where the windshield meets the fairing and add auxiliary L.E.D. Run-Turn lights at the same time! Amber L.E.D.s provide the illumination while your choice of Chrome or Gloss Black finishes compliment your style. Plug-&-Play wiring for simple installation. Fits '98 - '13 Road Glides. 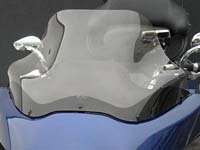 1309, 1370: Road Glide Windshield Trim. Make a clean transition. 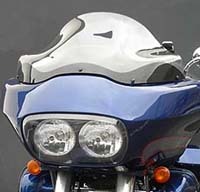 This handsome three-piece trim set provides a smooth, flowing bridge from the fairing to the windshield. Fits '98 - '13 Road Glides. Caution: Make sure to sit on your bike and measure for proper fitment prior to ordering, so that you have a sufficient non-obstructed field of vision for safe riding! We do not recommend looking through dark grey tint.